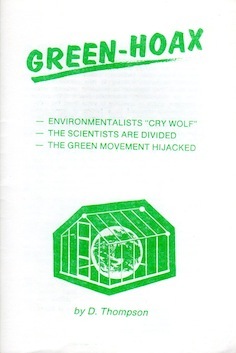 Environmentalists “cry wolf,” The scientists are divided, The green movement is hijacked. It is evidently a feature of the human psyche that we need a “cause” into which we can pour the passions of the spirit in the culture that has lost its spiritual* direction, the causes are many and varied. In the 80’s it is still global annihilation, but in the form of environmental catastrophe. Children are taught that life on earth is in its terminal stages, with Mother Earth choking and burning in a cess-pool of our own making. “We know that no-one seizes power with the intention of relinquishing it. Power is not a means it is an end. One does not establish a dictatorship in order to safeguard a revolution; one makes a revolution in order to establish a dictatorship.”-1984 by George Orwell. Mr. Hawke, Sen. Richardson and their colleagues, pursue power. Their current excuse is that they need additional power to protect the environment, and ‘life on earth’. But power is not a means to protect the environment, it is an end in itself. Once again the drive for ultimate power emerges with the international banking groups forwarding programs that can only end in a form of global dictatorship.